Reviewing your accounts receivable aging report at least monthly—and ideally more often—can help to ensure that your customers and clients are paying you. It at least tells you where they stand so you can take steps to collect if necessary. Accounts receivable sometimes called "receivables" or "A/R", are the amounts owed to a company by its customers. You might consider them as "payments due to my business." Receivables are considered a business asset because they have value. They're the total amount owed to your business. They're ranked high in the list of assets because they can be converted into cash. As soon as they're paid, they become cash. Some cash businesses or businesses that rely heavily on a customer who uses credit cards don't have any receivables. But if you bill your customers and if you offer them terms such as paying over time, you'll want to be able to run an A/R aging report so you can see how much is due from each of them. You're probably using the accrual accounting method as opposed to cash accounting if your business has a fair number of customers who don't pay immediately. This accounting method recognizes income when it's billed, not when the money is actually collected. It means that you must pay tax based on income which you might not have received yet. The process of collecting money from customers in this type of business typically begins with an invoice—a bill to the customer. 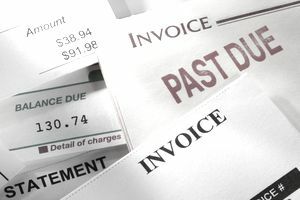 The invoice states the amount due and when it's due, including terms of payment. The payment terms sometimes include a discount for early payment. The accounts receivable report is based on the amount and the terms stated in the invoice for each customer. The purpose of this accounts receivable aging is to show you what receivables must be dealt with more urgently because they've been overdue longer. This report is standard with most business accounting software programs, including online systems. Rule number one in debt collection is that the longer a debt is owed, the less likely it becomes that you're going to be able to collect it. Knowing about your customers and their debts is vital to collecting from them. First look at the greatest amounts of money owed by all customers. Are these amounts current? Are they 30 days? Or have these bills been outstanding for 120 days or more? Now, look at those bills that have been due for a long period of time. Determine whether you're ready to take each of these customers to the next step of the collections process, sending the accounts to a collection agency or filing suit in small claims court. You might know that a customer's wife has terminal cancer so you might decide not to take that person to court. It's your company so you get to decide. Finally, use your collections system to determine how you'll contact all customers with bills 30 days or more overdue. Let the system guide you, but don't hesitate to make exceptions. You might also want to calculate a business analysis ratio called "average collection period." This calculation shows the number of days, on average, that it takes to collect on your business sales. You can see whether this ratio goes up over time, taking a long time to collect. If you work to improve your collections rate using the accounts receivable aging report and other financial analysis tools like the average collection period, you can improve payments and have more cash in your business. Use the collections process you set up, and always remember Rule No. 1.